Lerosett is a Swedish maker of acne products. They make bold claims for products that seem to be designed for fair skin—but do their products work? Aloe vera is the main ingredient in the Lerosett product line. Lerosett is a line of acne care products made in Sweden. Lerosett advertises that its products are free of added chemicals, but they all contain added chemicals. The main ingredient in most Lerosett products is aloe vera gel, from aloe vera plants raised in greenhouses in Sweden. Greenhouse-grown aloe vera has especially low concentrations of chemicals that heal the skin. Aloe vera gel in general has no special benefit for acne. Other ingredients added to Lerosett products can actually make acne worse. If you have rosacea, and you live in Scandinavia, Lerosett products might be helpful. For common acne care, try Exposed Skin Care. 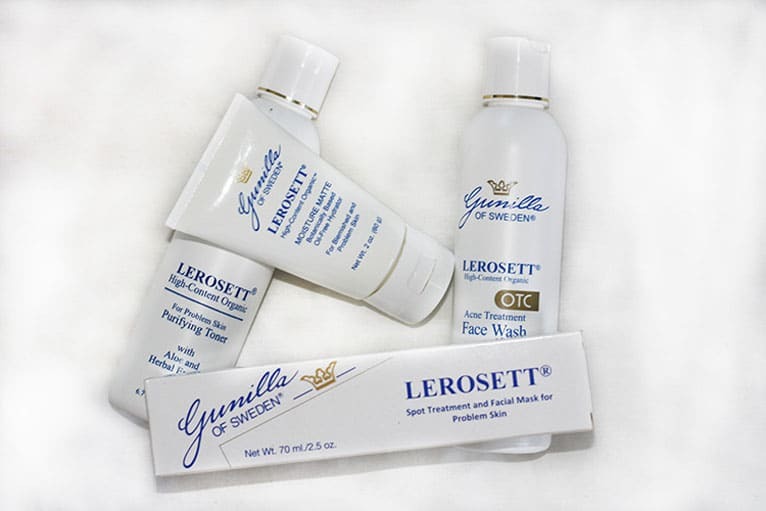 Lerosett is a maker of acne products that has been operating in Sweden since 1985. They make products that are 100% organic. They advertise that their products are free of drugs, toxins, and added chemicals, and that they do not use benzoyl peroxide, sulfur, mineral oil, parabens, dyes, detergents, or soaps. Does Aloe Work in Treating Acne? Since most Lerosett products emphasize aloe vera gel as their primary ingredient, it’s a reasonable question to ask whether aloe really has an effect on acne. The bulk of the scientific data suggests that aloe vera gel is fine for treating inflammation that comes as a side effect of acne treatment, but that has no real use in acne care. You are experiencing redness and inflammation after recent microdermabrasion treatment. You have been using benzoyl peroxide to treat pimples and you have a problem with dry, itchy, or peeling skin. You tend to develop brown spots after acne treatment (a special problem on Asian skin) and you need a secondary treatment to prevent excessive irritation from acne treatments. You have an acne-like staph or strep infection of the skin. Dry skin makes indented acne scars look even more prominent. You forgot to use sunscreen or sunblock and you got a bad burn when you went out into the sun. You tend to get pimple-like infections of the skin when you use a hot tub or you visit a water park. Aloe vera gel, however, has no direct effect on acne. If you live in a country where winter cold tends to dry out the skin, aloe may help keep your skin moist so you get fewer tight-skin blemishes, but it will do nothing to repair acne blemishes once they occur. Moreover, the healing chemicals that naturally occur in aloe are concentrated under heat stress and drought—which do not occur when the plant is grown in a greenhouse. What About Other Ingredients in Lerosett Products? Although aloe is the primary ingredient most Lerosett products, other herbal extracts are also listed among the ingredients. Some of them are helpful in treating acne-prone skin, while others are not. Let’s take a look at herbs and botanicals commonly used by Lerosett. Many of the botanicals used by Lerosett are listed by their Latin botanical names (many of them misspelled). Arnica is used homeopathic doses (less than 0.0000001%) to treat sore muscles and bruises. Even a 1% arnica extract can cause an abortion in pregnant women or induce irregular heart rhythms in older adults. The exact amount of arnica used in Lerosett products is not stated. Marigold (Tagetes) extracts can fight staph infections. They can also trigger flare-ups of eczema, especially when they are used with arnica. Chamomile (Matricaria) extracts generally reduce inflammation and soothe allergic reactions in the skin. Witch hazel (Hamamelis) can open the skin when it is used with a salicylic acid skin toner. Otherwise it tends to “tan” the skin locking sebum inside pores. St. John’s wort (Hypericum perforatum) makes the skin more sensitive to sunburn. If you live in Sweden, this won’t be a problem. If you use St. John’s wort extract on your skin in Florida, it almost certainly will. Lemon oil or lemon peel oil, unlike lemon juice, usually irritates the skin. Grapefruit seed extract fights a variety of skin infections, but not acne bacteria. Aesculum hippocastanum (horse chestnut) extract helps tone and firm the linings of capillaries beneath the skin, so that they are less likely to leak blood when the skin is heated or stressed. And despite claims that their products do not contain chemicals, in Lerosett face wash, moisturizer, and toner one can find carbomer-940, isododecane, laureth-4, nylon-12, sodium PCA, tetrasodium EDTA, triethanolamine, and urea. If Lerosett Isn’t What It Claims to Be, Could It Work Anyway? Lerosett products clearly are not what their advertising claim. Their major ingredient is a botanical that has no effect on acne, and they use a form of that botanical that has the smallest concentration of healing ingredients. Other ingredients in the product can cause as many problems as they correct, and there are also a variety of chemical ingredients of dubious efficacy—and one, laureth-4, that is a major cause of chin acne in women. But are the products totally useless? Actually, if you live in Scandinavia and you have rosacea, rather than common acne, they might actually help. Rosacea needs strengthening of blood vessels combined with overall reduction in inflammation. If you have rosacea but you don’t have allergies, and you either spend your time indoors or live in a part of the world like Sweden where the sun is not harsh, Lerosett may do you a little good. But the results won’t be spectacular. If you have rosacea, Lerosett is worth a try, provided you buy your products with a money-back guarantee. If you have mild to moderate common acne, you are more likely to get good results with Exposed Skin Care. J, Thank you for leaving your comment. I have been looking for alternatives for my daughter to use other than the standard antibiotics and acutane for cystic acne. I have seen other good reviews on 2 other websites. I almost decided that Lerosett may not be worth it until I saw your response. Seconding J's comment. This incomplete review did not address or even mention the original and most important Lerosett product - the clay! This stuff really delivers, and cleared up my problem skin when I was younger. Now, at the age of 49, I no longer have acne issues, but I still keep a tube of Lerosett around to spot treat the occasional breakout and calm the mild rosacea that has developed in recent years. The clay mask is amazing. I disagree with this article, I have used Lerosett products for me and my teenage son. Both of us cleared up.The moisturizer didnt leave any kind of residue, which I was surprised about. I only wish the product was something I could buy in stores. Not something I could say about proactive or any other product that I have tried. I'm on my thirties and I used Lerosset (the clay mask) when I was 16-17 yrs old and it really helped to clear my acne. Now I'm starting to break out and I luckily found a brochure I kept since I was 16 yrs. old because I couldn't remember how was it called in order to buy it again. Does this product work on extremely large pores. I'm only 19 and have become so depressed suicidal and self conscious about myself nothing has ever worked for these huge holes on my face. I've seen people with big pores but honestly never as big as mine their getting bigger and bigger. I was just wondering has this helped anyone with huge pores. I know your comment is old but honey ther is way more to your beauty than your face!!! Don’t give up girlie. People who see the real you are always your true friends anyways. And I think the Lerosett really helped with pores. I’m guessing a diet change would really help you. You may be allergic to gluten or sugar which creates a major overgrowth of yeast in your body. I was disappointed with the price and efficacy of the Lerosett line. I gave this product a try for a good 4 months religiously . I used the cleanser, moisturizing matte lotion, clay spot treatment as well as the clearpoint supplements. I have inflammatory and cystic acne on my cheeks and jawline. These products made my acne worse over the 4 months with bigger and painful cysts. I would not recommend this product for severe acne it may work for people with less severe acne. After I stopped using the product it took about 3 months for the painful cysts yo subside and slowly face away. I went to a dermatologist and was prescribed accutane and I am seeing great improvements after 3 months. If you have a inflammatory or cystic acne go see a dermatologist. The ingredients in Lerosett DO NOT great severe acne like they say. It is false advertisement. Go see a derm if you have the same problems as me. I agree Lerosett is amazing. The clay spot testament and mask is the only thing that’s ever worked for me. Whoever wrote the article seemed very bias against it. But I’m 40 and wish I’d have had this as a teen! !